The UCSC Farm & Garden is first and foremost a teaching farm, dedicated to training the next generation of responsible soil stewards . . . and farmer-florists. We sell organically grown flowers from our fields and gardens for extra special events. their events personal and unique. Each bucket holds 80–120 stems of a mixture of focal flowers, accent flowers, filler and foliage. This is a great option for those on a budget or who love the idea of arranging as a hands-on activity. Each bucket makes 4 to 5 medium size bouquets or centerpieces. If you prefer that we arrange for you, we also design handcrafted arrangements. Prices depend on size. For bridal bouquets, bridesmaids’ bouquets, or in your own special vase as a statement piece. At this time, we do not offer flower crowns, boutonnieres, garlands, etc., but we are happy to refer you to local farmer florists who can serve your needs. Please note: While we sometimes have spring blooms as early as February, our peak growing season is June through October, and varieties are subject to seasonal availability. Please fill out this form if you are interested in ordering flowers for your special event. Click here for a list of prices and policies. To contact us about flower sales, email us at flowers@ucsc.edu, or call (831) 459-1639. If you are arranging for an event the day before, it is best to keep the arrangements in a cool dark place, such as a garage or hallway, until the event. 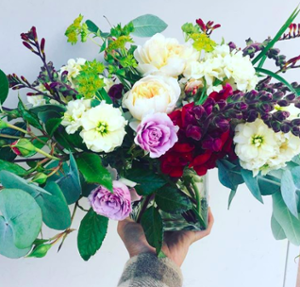 The UCSC Farm and Garden training programs include an introduction to cut flower production, bouquet making, and design, with an emphasis on using seasonal blooms. We hope that our graduates will help continue to grow the sustainable, local flower movement.